Ear training is a skill by which a musician learns to identify, solely by hearing, the basic elements of music. It is an integral component in music education, and perhaps the foundation for becoming a good musician. While you can learn to develop an ear for music at any age, the best time to do so is in early childhood. And ear training can be fun with the right tools. For your child, I’d suggest Easy Music. It’s a new app from Edoki Academy that offers nature-themed activities designed to help kids recognize notes, pitch, rhythm, and melody. Easy Music includes two sections: Practice and Compose. New app users are recommended to start with the Practice section, which consists of 4 multi-level games and 1 bonus activity. Here, a friendly dragonfly character will act as a guide and provide helpful tips on how to get started in each game. 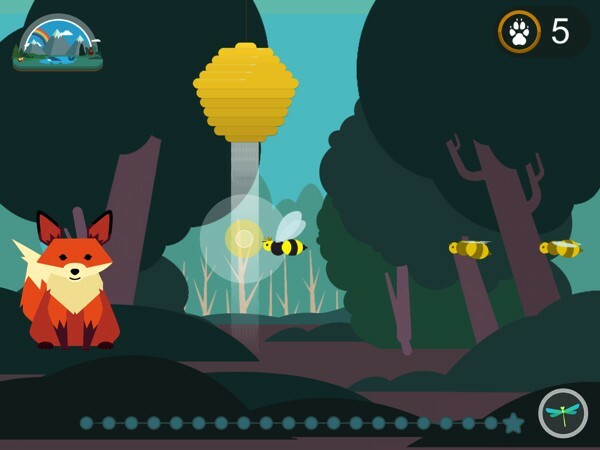 The 4 games in this app are represented by animals: the frogs, the whale, the bear, and the fox. Each animal can be found in different places throughout the game world; simply drag the screen right or left and tap on the animal to play the game. Below, I will run you through each game and what they aim to accomplish. The frogs game is about note and melody recognition. Here, kids must repeat after the frogs by tapping them — similar to the game Simon Says. New gestures and sounds are introduced over time, which results in increased difficulty. For example, later in the game they might be required to tap more than one frog at the same time to achieve a harmonious note. The whale game aims to develop a sense of relative pitch. In this activity, kids must repeat after the whale by tapping the vents in the correct order. Difficulty increases with the addition of more vents. A total of 7 vents may be present in later stages of the game. The bear game is designed to help kids count individual beats as the prerequisite to understanding rhythm. In the activity, they must first listen to the number of hits made by the bear. Then, they must tap the flower the same number of times. Different drum sounds are added over time, and in the last level, kids can only rely on hearing to count the number of hits. The fourth game, in which kids play with the fox, helps them understand the concept of rhythm. They must tap the bees in rhythm to make sure the fox doesn’t get stung. Similar to the other games, here difficulty will increase gradually. The last level, for example, will not have visual aids. Once all 4 games have been completed, the rainbow piano will be unlocked. Here, kids are guided to play several popular nursery rhymes such as Mary Had a Little Lamb and Twinkle, Twinkle, Little Star. Optionally, they can select the free-play mode and play any song they like. The Compose section is a musical sandbox where kids can create music by tapping on the objects on the screen. They can also record their masterpiece to share with family and friends. The sandbox comes with 3 interactive scenes: the Little Bear’s room (jazz theme), the Flamingo’s room (beach theme), and the Panda’s room (electronic music theme). Do note that if you have an Apple Watch, you can be your child’s co-composer. Simply open the app on your Watch, and play the percussions. It’s a great way to support your child’s learning while having fun together. Easy Music is designed to help ages 5+ develop an ear for music in a fun and intuitive way. The app has been reviewed and approved by Evan Fein, an ear training expert. If you are interested in learning more about the app’s pedagogy, you can read the parents/teachers guide from the Settings section. Easy Music contains no third-party advertising and no in-app purchases. It works well without an Internet connection, and is available in 19 languages including French, Spanish, Portuguese, German, Chinese, Korean, and Indonesian. A big part of what makes Easy Music successful is its ability to present the lessons in a fun and intuitive way. They’re cleverly disguised as games, which kids will enjoy more than memorizing complex theories. But what the kids don’t realize is that as they play, they are developing their rhythmic ability, melody recognition, and musical memory. The games are designed with a gentle learning curve, so kids of any level can easily pick them up and play. True to the Montessori approach, they emphasize on progress instead of rewards and punishments. Parents and teachers can then track the child’s progress from the in-app report. Visually, the app will appeal to kids with its colorful artwork and fun animation. It’s easy to use, and the guided narration ensures that kids are able to navigate their way through the app. Easy Music is a unique app that provides ear training activities to help kids become good musicians. It uses an intuitive, non-theory approach that is accessible by kids of all levels. The games have increasing difficulty, but a gentle learning curve. All in all, it’s worth checking out if your child is beginning their journey into music. Zen Studio is a sleek, easy-to-use finger painting app that helps kids relax and focus through geometric-based creation. Kids can follow step-by-step tutorials to draw beautiful designs, or let their creativity take over a blank grid. All the while, a soothing soundtrack accompanies their movements on screen. Recommended for ages 3+. Name Play helps kids learn to read and write their names. This creative app includes several fun activities with many customizable components. Great for kindergarten-aged kids.